Great opportunity to live on the waterfront in Greenhithe in this superb timber home designed by award winning Sheppard and Rout architects. 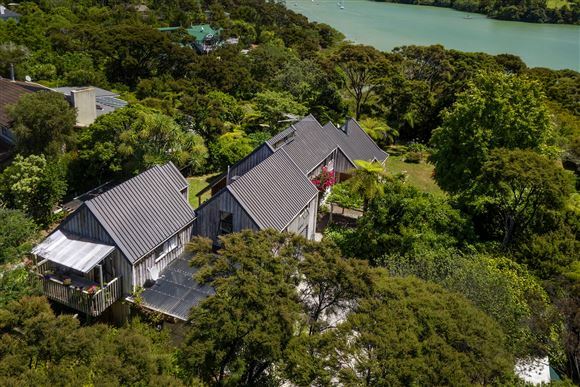 Presently configured as a home and granny flat, features include 4 bedrooms, 3 bathrooms, large open plan living areas - many rooms open to paved outdoor entertaining areas and expansive decks. The north facing home is on a very private 1580sq m site, has all day sun and enjoys stunning bush and sea views. The current owner had the house designed and built in 1982, has loved owning this very special property for the past 33 years and is now retiring to Cambridge. Now is your chance to purchase a wonderful property offering an unsurpassed waterfront lifestyle that caters for the whole family!